We're going to let the tile cure over night and then apply the grout. 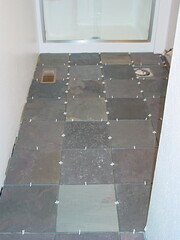 The white dealy-bobs are spacers to keep the tiles 'bout 1/4 an inch apart. You'll notice that the shower glass has already been replaced. More to come. One word of advice for future do-it-yourselfers . . . don't take on a project you can't complete within a reasonable amount of time. It's taken us over a month to complete this bathroom, mostly because we can only work on it one day a week. Had it been the summer, this project could've been done within a week.